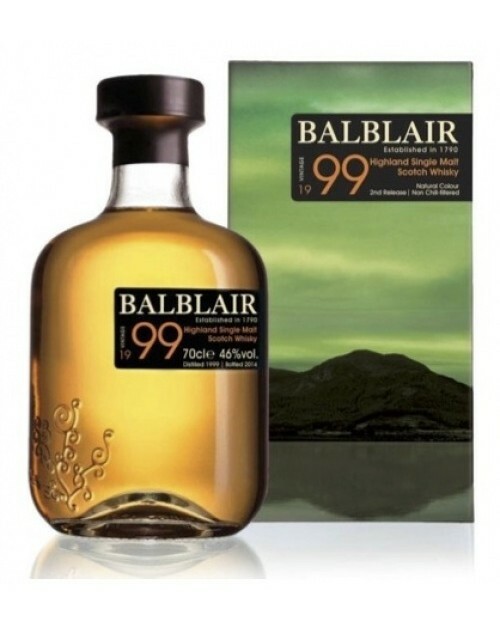 Balblair 1999 Vintage Single Malt Whisky is a small batch release from Balblair's hand selected choice of only the finest second fill ex-Bourbon and first fill ex-Oloroso Sherry Casks which were laid down in the traditional Balblair Dunnage warehouses on the banks of the Dornoch Firth in the year 1999. This expression is the second release. Nose: Honey and green apples develop with wafts of spice and vanilla. Palate: Full bodied, sweet and spicy with honey and leather notes. Finish: Long, smooth and lasting.